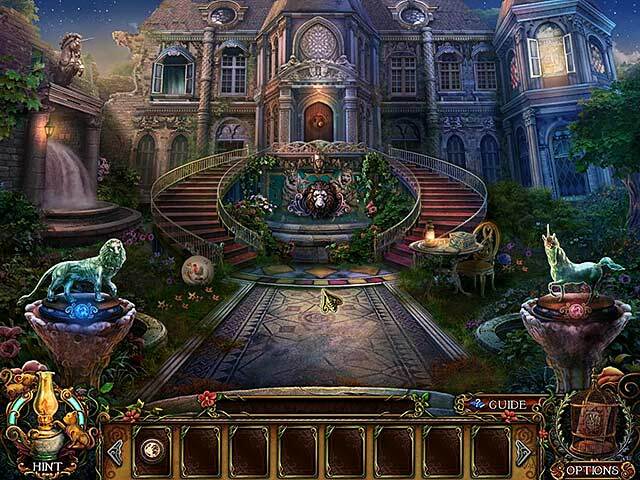 Rated 5 out of 5 by pirosca from replayable hidden object This is one of the most enjoyable game I've played. Good storyline and wonderfull graphics. Great puzzles. The fun of puzzles were exciting cause I was able to solve it. Rated 5 out of 5 by Tflo from Loved It! This is my type of game! Colorful, detailed, quirky characters, lots to do, etc. It is a definate buy for me! Rated 5 out of 5 by Purehay from Impressive scene design I really like the fantastic scene design in this game and also the super details graphic, Keep it, great job! Rated 5 out of 5 by valwhite555 from Interesting twists and challenges, Love the riddles on the mini games, the scenery is incredible and keeps my attention. Will be a favorite of mine. Rated 5 out of 5 by hibc60 from another great one but waiting for the regular version as others have said this is another great game from this developer who never seems to disappoint. based on the demo I thoroughly enjoyed it. however since I don't care about extras, (and I don't use sound so can't rate that) and did not use the walk through at all I will wait for the regular version to come out then will be a buy for me. 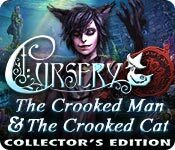 Rated 5 out of 5 by MomofBCMNC from Cursery: The Crooked Man and the Crooked Cat Collectors Edition Liked the idea of the nursery rhymes. Puzzles were both hard and easy. Great graphics. I don't really care for HO scenes that I have to find pieces to make 1 object. I like interactive HOS. Rated 5 out of 5 by Mariannababy from CURSERY - you caught my heart! I just finished the main game and the bonus chapters. That took me more than 8 hours and I enjoy these hours! And now I just want to play it again as I found there's "easter egg" haven't been revealed. VISUAL / SOUNDS - Gorgeous graphics as usual! Dark gothic, not much horror but magnificent enough to take your breath away! Perfectly match with the music / ambiance sounds, everything looks alive in the game. Especially I love the music in the game. The main theme, the waltz, the character theme music...etc. all of these are beautiful and touching. It's like movie soundtrack music and all in high quality. To be honest, I seldom download the music from a game even they are available in the bonus content in a game. But I downloaded them all from CURSERY in my playlist! MINI GAMES / FROG - There's a lot of mini games and a few FROG (compare with the other games made by BLUE TEA). FROG is okay for me. The are easy and the finished object is exquisite. It excellent for me and all the mini game lovers. These mini games are different from the boring typical puzzle you found in other games. (My favourite one is "3 Blind Mice".) The game level is not too difficult but quite challenging. Most of them are easy to understand the control and what you need to do. I like the instrustion is written in rhyme. I can guess the riddle what should I do in the mini game first (actually most of them are easy). Even it's really talking in riddle, I can see the real instruction by switching a button. STORY - Story is amazingly attractive! It's okay if you skip all the words and notes in the game, you can still enjoy the playing time. But if you care the story, you gain extra fun! It's not only a simple story about a bad guy kidnapped maidens and you need to defeat him. I thought it's a so-so story, just like a commonplace to be seen in many games. But I was wrong! Get into the story by reading the notes or diary you picked in the game, you will know the reason behind the villain. You are going to knowing the whole picture bit by bit, pieces by pieces. (Sorry, I don't want to spoil too much here. ;) ) I enjoy the experience of exploring the story by myself. Besides, there's many symbolism used in the game. (A room having many birdcages, the "M" symbol showing everywhere...and I still doubt that the "M" representing Mother Goose, or Marianne, or other things else...). I would like to play it again and see there's any "hidden message" given by the developer. (Just see in forum, seems the of name of "Housing Company" in bonus chapters is a fun!! :D) I do hope (Please, BLUE TEA!) and looking forward to see this sequel. The best game I played recently! If I could rate more, I would give it 10 stars! What else could I comment.... Oh, yes, it worths the CE price!! Rated 5 out of 5 by LADY_BLADE from BLUE TEA DOES IT AGAIN!!! What a fun game! The entire game is a takeoff of Nursery Rhymes with a twist (hence, Cursery). The Crooked Man has kidnapped your sister Renee - and several other young women over the years. Marianne and her little lamb tell you his story -- he is trying to recreate his dead fiancé. His Crooked Cat is a beastie that you have to keep defeating with one of your items. The one HOS scene in the demo is a FROG, but not too cluttered and easily viewed on large screen monitors. The puzzles are unique, with directions in rhyme - although you can have the instructions in plain English if you choose. The puzzles even seen to have a Mother Goose spin - in one you have to help 3 mice (blind?) find their way home. In another, the little pigs must defeat the wolves. You get a pop-up, teleporting map with hints, but no diary. The strategy guide is quite helpful. The hint button refills faster as you find the 20 morphing objects. There are 25 achievements and 24 collectibles (but I don't recall finding a collectible in the demo.) There are also 14 pop-up notes, but didn't find a use for them yet. The Bonus Game is about Humpty Dumpty! This is a fun game and a buy for me! Rated 5 out of 5 by puppynurse from New twist on Mother Goose This review is based on playing the entire game and the bonus chapter. I found this game to be fun and somewhat challenging. The story was a twist on a nursery rhyme that we have all heard more than once. I thought the graphics were good and the music fit with the theme. Although I dont think this game would be appropriate for younger children older ones might enjoy it. I found the mini games mostly easy some slightly challenging but not too much so where I needed to skip them. I almost found all of the cursed objects. The SG was extremely helpful and the hint button was also helpful but the game follows a fairly logical plan so I did not need the hint button very often. There is a map which you can jump to locations and the map is labeled well. I especially liked the underwater areas. Try it you may like it not all games will appeal to everyone but for me this is a purchase I am fond of. Rated 5 out of 5 by sunny64 from Fantastic game With the exception of the first game, I have every single Blue Tea game. Some are better than others, but most are very good quality and fun to play. The art work and fragmented shapes are exceptional for this one. I now have so many games, I think I'm getting fussy for choices, but have usually played most games from Blue Tea twice. I still love the fragmented games so thanks for keeping this format. Rated 5 out of 5 by eedebeep from A mature macabre twist on nursery rhymes Such a wonderfully creepy game, even a little gross at times (which I love!). Some of the comments in the game remind me of the MCF Ravenhearst games, which are the classic creepy HOPAS. The minigames were different and good, the HOS fun, and I enjoyed the game enough to forgive them for not having a control to turn off voices. I could have done without the inane rhymes in the minigames (yes I understand it was based on nursery rhymes, but still). The plot has a few odd jumps, but overall flows well. Highly recommended for those who love creepy games. Rated 5 out of 5 by slheizer from Amazing The story is awesome. Good job. Rated 5 out of 5 by mamakatze from Cursery Rhymes -- Challenging, Yes! Review is based on playing the Crooked Man CE twice. As soon as I saw Blue Tea, I knew it would be great and purchased without trial. What a visual feast, and just enough quirkiness to make it fun and a good challenge. Nursery rhymes originally made a political point. This cursery rhyme makes a point too -- beware gifts that feed your obsession. Will look for many more Blue Tea games along these lines. Rated 5 out of 5 by hennfish from Another winner enchanted to find another in Blue Tea series and again this one is beautifully done! both game and bonus chapter are challenging and artwork is like none other...cannot wait for next one from this group! Rated 5 out of 5 by banburycross from Great game I love Blue Tea games so does my grandson and this one did not disappoint..I enjoyed everything about it .Cant wait for it to come out .A definite buy for me. Rated 5 out of 5 by mad4football from Brilliant Love and own all the Dark Parable series so bought this without trying the demo. It's every bit as good, and although I've only played it for about 30 minutes, I can tell I'm going to enjoy it. Basically the same sort of game play with FROG's and a terrific storyline. Hope there will be more like this because there are plenty of Fairy Tales to choose from. So go for it devs. Rated 5 out of 5 by LA_Dzinz_UA_OH from Another 'Blue Tea' Success! If you are a fan of the 'Dark Parables' games, then you likely won't be disappointed with this game... I'm already a fan of Blue Tea [the developers] myself, but even knowing how much I like them, I was still surprised yet again, when playing their latest release. The graphics are outstanding, with beautifully illustrated and colorful scenes. Don't think every twist on puzzles [in HOPA games] has already been done, as this game - even in just the 1st hour - contains a couple not seen before. If you're not a fan of HO scenes, you may be happy to learn there were only a couple during the demo. If you ARE a fan, and remember how Blue Tea does a hidden object scene, you won't be disappointed, because it's their "signature" HOs... and we can only hope there will be more of the same throughout the game. [if you're not familiar, instead of looking for several objects to complete a list, it's "parts" of an object that are pictured at the bottom of the screen, which, once found, join together to complete one object. That's it in a nutshell -- but just play it, if you've never done before!] As far as I'm concerned, I hope they NEVER run out of "Cursery" Rhymes that Blue Tea can put their signature twist upon, and then present to waiting fans for just the sheer enjoyment of playing a great HOPA!! Rated 5 out of 5 by VickiS531 from Another stunning game from Blue Tea Games! Blue Tea has done it again. As soon as I see their logo, I immediately purchase the game without even playing. The amount of detail they put into their games is simply amazing. Great storylines and the fact this isn't a ordinary HOG but a fragmented one makes each of theirs a must have. Thanks Blue Tea Games, I'm now eagerly anticipating your next game and will be replaying each of your previous games until then. 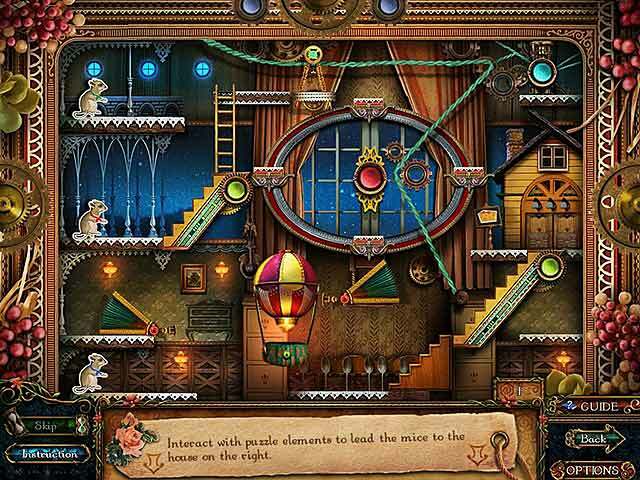 Rated 5 out of 5 by pduckett from Fantastic Hidden Object Game with lots to offer!!! My review is based on playing the 60 minutes of the trial purchase. The game begins as you are searching for your sister. You realize many young beautiful girls such as she, have been kidnapped as well. There are beautiful graffics throughout. Also the hidden object scenes are similar to those used in The Dark Parables where once you collect all the pieces it becomes a useful tool. There is also a magic map that allows you to move around once you have been to a designated area. Saves a lot of wasted time. Overall, well designed and fun. I will get the CE for sure! Rated 5 out of 5 by Ziggy_Zigster from Crooked? Not this game This review is based on the free trial of the Collector's Edition. The storyline is quite good, as are the graphics. The HO scenes are different in that instead of a written list of objects to find, you have little pictures, which helps. There are a LOT of puzzles, more than your average HO in my opinion which only adds to the gameplay. I have not tried the bonus game, so I can't comment on that. The best part of the game for me is the other bonus content. You collect trophies and gain achievements, which I really like in a game - it gives you a set of goals to add to the completion. The puzzles may be too easy for some, but I rather enjoyed them. I like a bit of a challenge, but not so challenging you want to pull your hair out. Another good part is that the HO scenes & many of the puzzles are all intertwined into the storyline. Overall, a great game. Rated 5 out of 5 by monty1 from Another winner THis review is based solely on the one hour trial. I fell in love from the beginning. The graphics are so beautifully done. I purchased the game using the discount offered. Can't wait to continue playing. Rated 5 out of 5 by stoneswife from Its Blue Tea I've been waiting for blue tea to make a new game for us. The graphics and sound quality are perfect.I loved everything about this game except the length. iwished it had been much longer. I haven't played the bonus game yet, but it's humpty dumpty, how much fun is that? 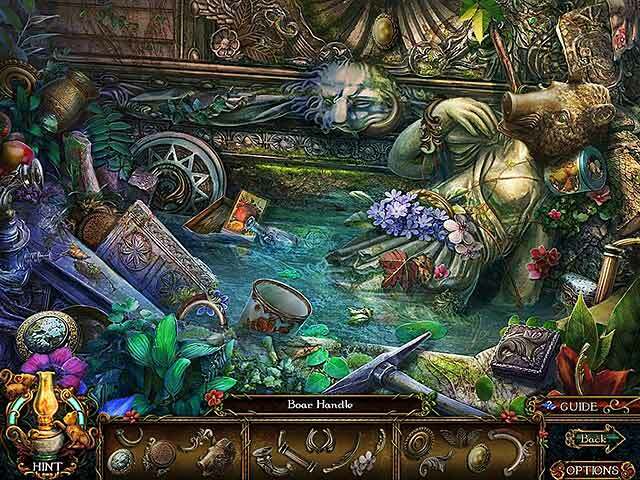 The hidden object games are their signature fragmented objects that are so beautiful. The mini games were easy, and i'm a beginner to these games so I'm sure that's going to be frustrating to the experts.Anybody who knows Blue Tea,knows this game is excellent. So buy and enjoy! Rated 5 out of 5 by DebMcG7 from Great game! I rarely give a game 5 stars. So many of the games seem to be a repeat of the others with just a name change. This one seemed more fleshed out. It had a interesting story line that kept me playing for hours. Very well done! Rated 5 out of 5 by jcsgame from Enjoyable Game I thoroughly enjoyed playing the regular CE game. The game is made up of: -3 levels of difficulty (that can be changed during the game) -Jump Map -Fragmented Objects HO Scenes -Many Unique Puzzles -20 Morphing Objects -Notes to Collect -Excellent Voice Overs -Clear/Colorful Graphics -Capability to replay Puzzles after the game is finished Those that purchase the SE version of the game will get the same ending as the CE version. The Bonus Game is a separate game called Humpty Dumpty. I personally did not care for this Bonus game because of the character's eating habits; you'll see when you play this game. Overall, I recommend this game and like I stated earlier, enjoyed playing it. Rated 5 out of 5 by Eleashia from the crooked man and the crooked cat collector edition i loved it wish i could own it but i don't have money to buy it for myself but other whise i love it. It's a good game in fact its a great game to me.